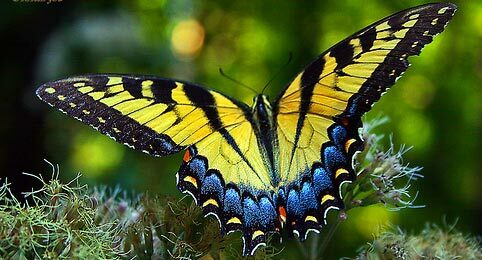 Special features: It would be difficult to confuse the swallowtail butterfly with any other. It's one of the prettiest and certainly the largest butterfly found in the UK. The name comes from the two tail-like extensions on the hind wings, which also feature two prominent red eye-spots. The young caterpillars have the appearance of bird droppings to protect themselves from predators. As they get larger they become pale green with black lateral stripes and orange spots. They also have a strange appendage on top of their heads which looks like an orange coloured snakes forked tongue. It's called an 'osmeterium', and for added effect it can be flicked in and out. It also emits a powerful scent like rotting fruit. Distribution: Found in the Norfolk Broads. On rare occasions migrants from the continent show up in other counties. Months seen: May to July. Food: Nectar. The caterpillars feed on milk parsley (Peucedanum palustre).